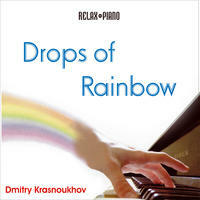 Dmitry Krasnoukhov : Drops of Rainbow. New age romantic piano music that brings calmness, rest and hope to a tired hearts. Epitomises the vulnerability of Chopin, melodies of Kevin Kern, filigree of Keiko Matsui's and the elegance of Giovanni and Richard Klaiderman.